we are getting slowly into a deeper jungle, our devices are more and more powerful, the apps make unbelievable things. we are substituting tricky, expensive and unstable computer setups for an ipad or an iphone in our live sets. when i perform live i have a minimum of 6 apps running. i have multigesture deactivated as some apps use 3 fingers also. so switching between all these apps makes my workflow awkward and my concentration in music decays. what if we could switch between apps just pressing a button or a pedal? that would be like the invention of the wheel! more than one year ago, in that thread, they already where talking about this. michael agreed this was a very good idea, and pointed that audiobus (not in the first version) could solve this. we all see audiobus as the solution to many ios limitations, we pin our hopes on michael and sebastian, and this time it couldn't be otherwise. @michael @sebastian i know you guys are working so so hard to release a lot of new features and in a complete re-buid audiobus2, but is there any chance you consider to implement this basic feature in a close future? i hope we don't have to wait to audiobus3 to see midi implemented!! btw: i play a very important concert next january 25th... will i play it using audiobus 2?? MIDI mapping in Audiobus is something that sounds interesting and useful but it's not going to be part of the 2.0 version of Audiobus, which will also not going to be available on the 25th of January. i know. i was just dreaming. but you woke me up suddenly! i'm going to have a coffee. Does... does it help if I tell you that MIDI support as you describe it is something I'd also really like to see? i wonder how its implemented in the novation launchkey mini controller. i know it is mapped to switch between launchpad and launchkey apps through the hardware. The apps are listening to specific MIDI commands that the controllers are sending. It's a good system but it's taylor made for Novation controllers. thought as much. novation are clever that way. Just "playing" with the Launchkey, I can say it s nice to switch between their two apps. Couldn't a MIDI controller app just implement a trigger that can execute an http command? Not that I know of any MIDI controller apps that do this yet. if you had a midi translator you could do a variety of things. i have no idea if there is a library or something out there that lets you translate midi notes and cc's to commands in ios, but that would be awesome. If the app supports OMAC Fast Switching, I pretty sure you can do this with MIDIBridge. If @MIDIDesigner or another MIDI controller app would add a new message type with a URL field, then we could just add the right line of URL for the app we want to launch, then set a MIDI Designer sub-control to trigger the URL when it receives a certain MIDI note or CC (from a pedal, etc). wau, the URL trick made me jump! it seems something not so difficult to implement. i suppose someone will make it possible if developers think we are demanding it. for me this should be like one of the first and more obvious functionalities to have been implemented. one of those basic things you shouldn't even care about, because it already happened, it's natural, and works... maybe i am the only one? @eccecelllo and @hmtx does MIDIbridge not do what you want? anyway, if there's no interest from our side. it will never happen. The Midibridge implementation is pretty sweet. its a little hard to figure out but I'm sure Nic could help decode the messages you want into hex. I'd love to have the use of an "app transport" on my controller. That really would be pretty awesome. Here's an idea, although it's not exactly what you're looking for and you may have considered this already . . I have an Arturia Minilab but I'm sure other controller keyboards have this: I can map my 16 midi channels to 16 different midi apps, by pressing 2 buttons on the controller I can access any of those 16 apps I want (given that they support background audio.) Granted, it doesn't bring the app itself to the foreground, but you would have access to a massive amount of sounds without having to touch the iPad. Maybe you could somehow play one while you're tweaking another onscreen. Just a thought, might help your workflow in the meantime. @ thanks christian, but i really mean to be able to switch the app, be able to see the app. +1k for having app switching on my controller(s). Would greatly speed the work flow and would be a game changer for live sets especially. Whether perception or reality, I feel like I'm on the edge of losing the audience during transition between songs. good idea with the http to open apps. But the method Christian is talking about is a very good one. Actually it's the same method that was used in the 80's until today on computers: using different MIDI channels to address different expanders or sound modules. In ipad Settings, you can set many music apps to receive on a particular MIDI channel. Omni means it will receive all 16 channels. 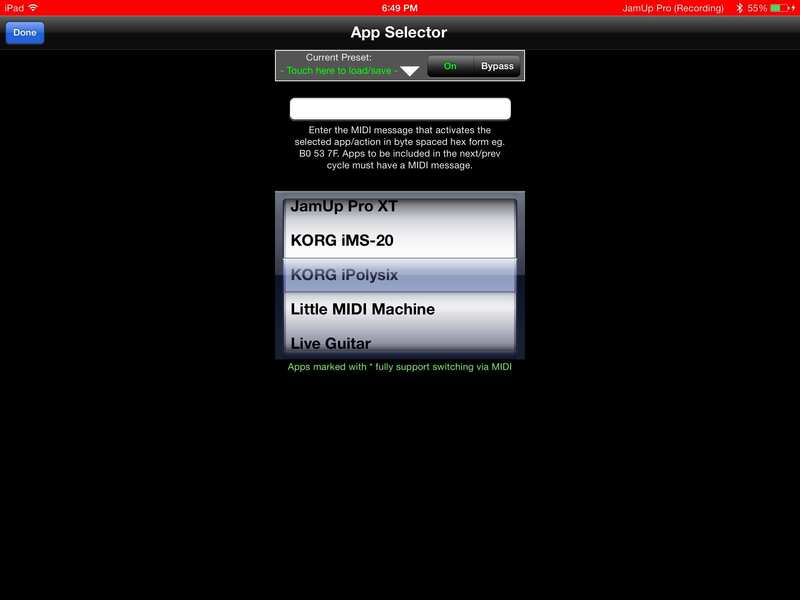 Set it to a unique channel for each app, enable background audio, and you can directly address each music app from the MIDI keyboard using its MIDI channel selector. And with a sequencer/DAW you can trigger several apps at the same time. Like this, the iPad becomes your synth/sampler rack. Old knowledge, but surely useful for newcomers. For those Apps that implement OMAC switching, you can do it with MidiBridge, with its App Selector filter. Of course, nce you get MB, you'll find it an essential member of your toolkit for it multitude of other things it can do for you. @hmtx oh my dear! thanks a lot for coming out with this URLs trick!! a very kind developer has taken pity on me, and he is implementing this midi-app-switching hell thing. and he says it f***ing works!! i will keep you posted as soon as i have the beta, and will make a video of it. then will reveal the name of that son of god who has brought peace to my sleepless heart, and made me sleep today like a child, starting to dream again. I can't wait to see the new program/feature. it doesn't work. he's tried more deeply, but it doesn't work if the app to recall is in background. from my viewpoint pressing a switch-knob-key-pedal and recalling an app to the foreground will become a standard feature in iosmusic world. that's obvious. but it needs from a developer/app that can put together all other music apps, so all of them implement this "midi bring to foreground" thing. it wouldn't be more than some lines of code. just a day of work for a good coder. ...the only ones who can join all music apps together are michael and sebastian, but for sebastian's answer, it seems clear that they don't even consider it for ab2. i am afraid that from now on, as audiobus is becoming bigger and bigger, things will be done when they decide it's the moment. depending also on other considerations like commercial opportunity, need to dose the offered features to have always a new thing to give, the dictatorship of the majority (those times when ios music was for minorities). what i like from iosworld is that it's small. unlike before it appeared, nowadays you can contact the guys that build the tools you work with, and they have fun and enjoy implementing things you need, or adding little changes that will make it easier for you. i hope this doesn't change ever. it's the first time in these last years that a developer says to me "no, sorry". but i accept it, i am trained with girls. i got a lot of "no, sorry" in the past, and i can live with it. i can also live with... stopping playing my cello, press home button twice, swiping with my finger until i find the app i am looking for, touching the app, taking a look -everything is ok- then repeat all steps again. Did you miss my OMAC switching comment? Do you have MidiBridge? It will accept any arbitrary MIDI message from any port to map to almost any App you have. And it has next / prev. And it switches backgrounded Apps back to foreground. They themselves do not have to have a UI to switch again (few do) but the MIDI control makes that not important. There are about 80 Apps that implement it, so far. Well, not so good. Just testrd a bit more completely and it will switch from MidiBrisdge or litle MidiMachine to any app, even in background, but it seems the apps have to have implemented a littl helper (behind the scenes, MIDI support:(, to switch anywhere else. Apparently at this time only MidiBridge iand its siblings do that bit. But tell your developer friend that it can be done even to backgrounded Apps, at least one way, but needs dev support to finish the job. @dwarman thanks a lot! i read your post... but one of the developers i was talking to was precisely nic from midibridge (who is doing great efforts to solve this midi jungle thing)... and as you well said, the problem is that it needs from other's developers support to implement it, and make it work. given that some of the apps i more use are loopy and audiobus, and seb didn't like at all the midib.us thing... i don't think ab team will collaborate with him to make it possible. anyway, this switching app thing seems to care only for me and two more guys. so it won't be done in a close future. but i am sure it will be a very basic feature not very far, like having keyboard shortcuts, you can live without them, but how easy they make our workflow! FWIW, I'm definitely interested in this for performing live too. someday our prayers will be listened.